The Sloughi /ˈsluːɡi/ (Berber language: oṣkay or occay) is a North African breed of dog, specifically a member of the sighthound family. It is found mainly in Morocco, which is responsible for the standard, and may be found in smaller numbers elsewhere in North Africa. The Sloughi is a medium-large, short-haired, smooth-coated, athletic sighthound developed in the Berber world of North Africa (in the area including Morocco, Algeria, Tunisia, and Libya) to hunt game such as hare, fox, jackal, gazelle, and wild pigs. It is an ancient breed, treasured in North Africa for its hunting skills, speed, agility, and endurance over long distances. It is a robust, but elegant and racy, pursuit dog with no exaggeration of length of body or limbs, muscle development, angulation, nor curve of loin. The Sloughi is not a fragile dog, but is also a dog with class and grace. The attitude is noble and somewhat aloof, and the expression of the dark eyes is gentle and melancholy. The Sloughi's head is long and elegant with drop ears. The body and legs show defined bony structure and strong, lean muscles. The skeletal structure is sturdy. The topline is essentially horizontal blending into a bony, gently sloping croup. The tail is long and carried low with an upward curve at the end. 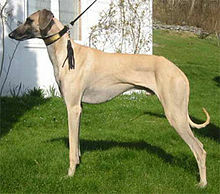 Consistent with many sighthounds, the Sloughi has a sensitive character that is devoted to its owner and family. It does not respond well to harsh or corporal training methods and does best with an owner who is also sensitive, intelligent and conscientious. The Sloughi responds best to training that is based on positive reinforcement. The Sloughi is largely unchanged from ancient times, and so retains a robust genetic health. Only a few genetic conditions have been confirmed in the breed. These include certain autoimmune disorders, such as Addison's disease and irritable bowel syndrome and progressive retinal atrophy. The Sloughi is one of the breeds for whom a genetic test for progressive retinal atrophy has been developed to with a simple blood test. Like all sighthounds, the Sloughi is very sensitive to anesthesia, and can be sensitive to vaccines, worming, and other medications—so these routine treatments should be spaced apart instead of given all at once. The breed tends to enjoy excellent health into old age. It is thought that Sloughis originally came from what is today Ethiopia (ancient tributes to the pharaohs included smooth Lop-eared Sighthounds from Nubia, south of Egypt). On old fragments of earthenware (about 3000 B.C. ), a short-haired sighthound with lop ears was discovered that resembles a Sloughi. The sloughi should not to be confused with the smooth Saluki of the Arabian peninsula and the Middle East, nor to be confused with the smooth Afghan Hound. The Sloughi was and still is used for hunting in its native countries, and also is a reliable guard dog. Today, the Sloughi is found mainly in Morocco, Algeria, Tunisia, and Libya. Morocco is responsible for the breed's FCI Standard. The Sloughi received full recognition by the American Kennel Club as of January 1, 2016 when it became eligible to compete in the AKC Hound Group. ^ "Sloughi". Encarta. Microsoft Corporation. 1997–2008. Archived from the original on 2009-11-01. Retrieved 2008-12-05. ^ FCI entry for "Sloughi"
"Sloughi: The Arabian Sighthound", 1996, by Ermine Moreau-Sipiere, Alet Publishing. "The Sloughi 1852-1952" 2008, by Dr. M.-D. Crapon de Caprona, Signature printing. This page was last edited on 20 April 2019, at 11:22 (UTC).